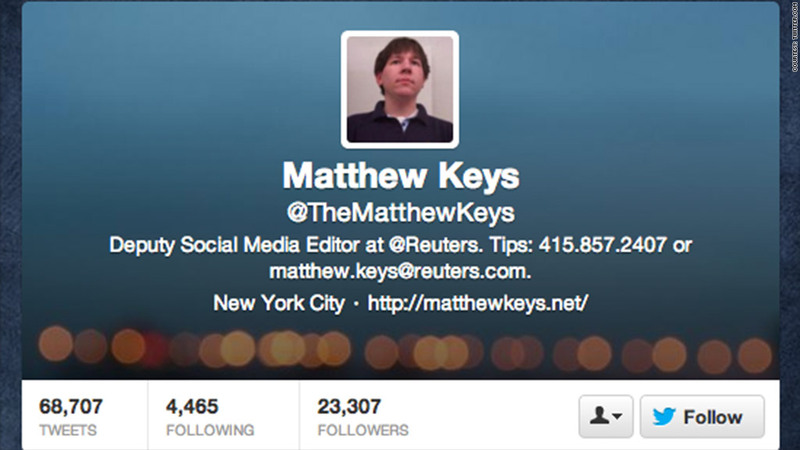 Reuters' popular social media editor Matthew Keys was charged Thursday with conspiring with hacker group Anonymous to break into the network of the Tribune Co., his former employer. A grand jury in California indicted Keys Thursday, the U.S. Department of Justice announced. The complaint says Keys, 26, was fired in October 2010 from his job as a web producer at Tribune-owned California station KTXL FOX 40 (which is a CNN affiliate). Two months later, the government says, he gave members of Anonymous the log-in credentials for a computer server at Tribune. Keys allegedly posted to Anonymous members in an online chat urging them to "go f--- some s--- up" with the login information. According to the indictment, at least one of the hackers used the credentials he provided to log into the company's server and alter a news story on the Los Angeles Times website. The Tribune Co. (TRBAA) declined to comment. Reuters said in an e-mailed statement that the company is "aware" of the charges against Keys. The company mentioned that legal or ethical violations can result "in disciplinary action," but Reuters carefully noted Keys' alleged behavior occurred in 2010, two years before he joined Reuters. Keys tweeted Thursday afternoon that he is "fine" and will return to "business as usual" on Friday. Last year, Keys wrote about chatting with members of Anonymous, and he provided logs to media outlets like Gawker and PBS. Court documents include the log of an alleged online chat between Keys and an Anonymous member nicknamed "Sharpie," who detailed accessing the Tribune server to alter the LA Times story. "Sharpie" turned out to be "Sabu," a former Anonymous member who notoriously became an FBI informant after his arrest last year. Sabu, whose real name is Hector Xavier Monsegur, provided the government with the information to indict Keys. The Justice Department has charged Keys with three counts related to transmitting information to damage a "protected computer." If Keys is convicted on all three counts, he could face a total of up to 25 years in prison, nine years of supervised release and a fine of $750,000. Keys is scheduled to appear in federal court in Sacramento on April 12.